Mike Hayes has been president of and directed the Ricki Rarick Junior Golf Program since 1992, a program that provides affordable golf opportunities for youths during the summer. 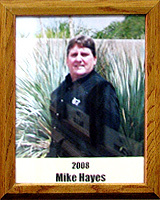 As of 2007, Mike is also deputy director of golf operations for the Tucson Parks and Recreation Department. He has served as assistant or head golf pro at Fred Enke Golf Course, El Conquistador Country Club and Forty Niner Country Club. He was also a caddie on the PGA Tour for Jack Newton from 1980-83. Mike graduated from Salpointe Catholic High School and Pima College, and played golf at both schools. He participated in Ricki Rarick Junior Golf (1971-76) and the Arizona State Junior Amateur Golf Tournament (1973, 1975-76). He has been a scoring official for AIA regional and state tournaments since 1995, helps run the annual Senior Olympics golf event and volunteers with the Tucson Conquistadores Special Olympics Golf Clinic. Mike has received numerous awards, beginning in 1983, from the Southwest Section PGA and has served on many organizations’ boards of directors, including the Tucson Conquistadores Youth Golf Fund.